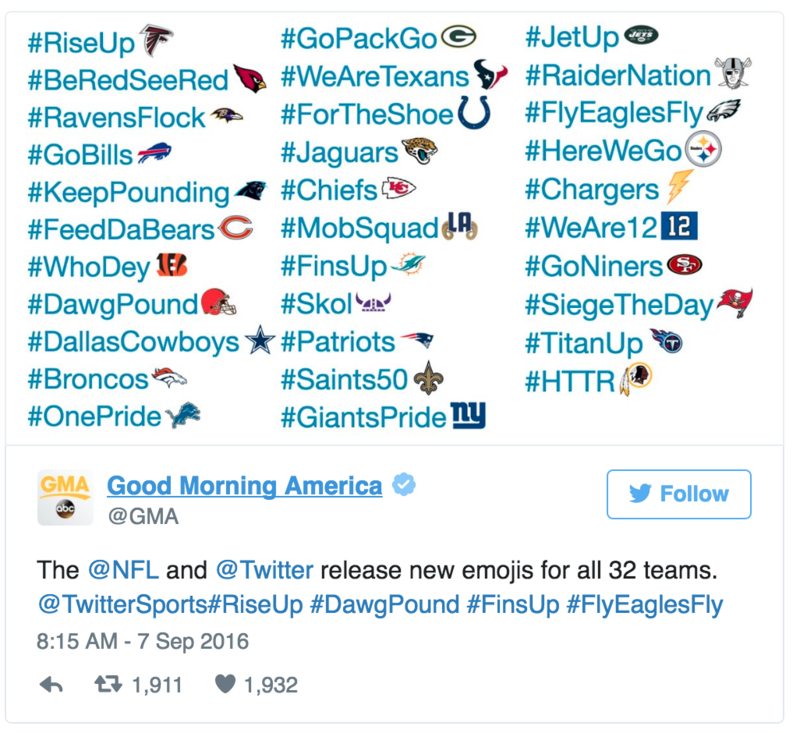 The NFL is assigning official hashtags for each of the 32 teams. Anytime someone uses one of these hashtags, an emoji of the team logo appears right next to the hashtag. Tweet out #Broncos, and you’ll get a Broncos emoji next to the hashtag. It’s pretty cute when that happens. Back during the Olympics, whenever you tweeted #Rio2016, you got the Olympic rings next to your tweet, like magic! The emojis are fun, but they can also be kind of controversial, because it’s Twitter the corporation deciding what hashtags mean. I wonder how political users who tweet #Patriots would feel about having an NFL logo appear next to their tweet. Kinda odd. Even more odd would be if a St. Louis Cardinals fan tweets the #Cardinals hashtag; and then the Phoenix Cardinals emoji appears next to the hashtag. Yipes! Same thing with San Francisco Giants fans tweeting #Giants only to have the New York Giants emoji appear. I had to google what #HTTR was. At first I thought the NFL was making all Redskins fans into haters. It actually means Hail To The Redskins. Which, is rather surprising. The NFL is actually encouraging this controversial name by hailing it? Or maybe the NFL thought they could hide the name behind an acronym. Either way–Yipes! Any idea how they came to these ones? #gopackgo makes sense and is probably the best one. The #flyeaglesfly is also good. #feeddabears, uhh, not so much. #DallasCowboys makes sense, but I’ve seen #CowboyNation hashtag used for them a lot on Twitter. #HTTR is the worst all around. For what it stands for. For the fact I have no idea what it stands for. The fact that they are encouraging the use of the Redskin name. Not sure about #skol either. I thought maybe the NFL approached each team’s marketing department to find out what slogan they are using this season. And then the NFL ran with that slogan. However, I don’t think that’s the case. I quickly looked over the chicagobears.com website and couldn’t find any instances of “FeedDaBears”. Even a google search on their site (“FeedDaBears” OR “Feed da Bears” site:chicagobears.com) didn’t result in any hits.